John Bensalhia looks at five well-known Italian festivals, and investigates their backgrounds and notable quirks. In June 2012, we listed some of the notable Summer Palios – events around Italy in which teams competed for the honour of winning the palio, a richly decorated flag which signified that the winning team could keep the prize in their neighbourhood church until the next contest. 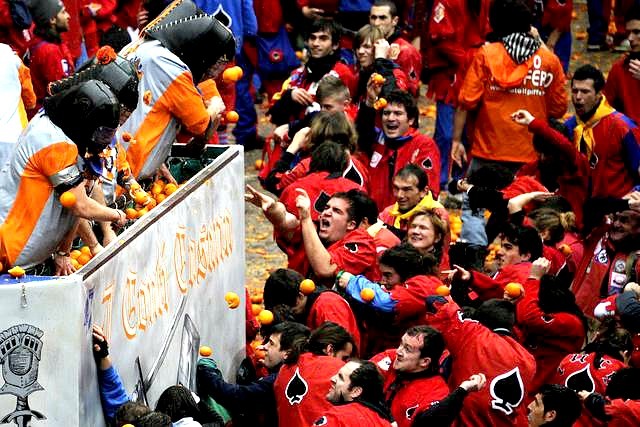 The Battle Of The Oranges is said to represent two possible events. The most commonly held theory is that it represents an uprising against the cruel regime of a vicious tyrant. It's likely that the tyrant in question is Ranieri di Biandrate. In 1194, his castle was destroyed by the local population – the tyrant himself also came to a sticky end, and his downfall is where the real motive for this festival comes in. Ranieri di Biandrate is said to claim that it was his right to sleep with any bride on her wedding night. In the case of one unwilling victim – a miller's daughter called Violetta – she refused and instead cut Ranieri's head off with a dagger. In the Battle Of The Oranges, a girl is selected to play the part of Violetta. The symbolic destruction of the tyrant's abode is represented by the throwing of the oranges – while the oranges themselves are said to represent Ranieri's head. It's also worth noting that another theory about the annual battle is that it represents Violetta's stand against Holy Roman Emperor, Frederick of Swabia (also known as Barbarossa). The Battle Of The Oranges attracts thousands of townspeople. The willing participants are then divided into nine separate teams who are then dressed in long, red Phrygran hats (which represent freedom). The teams then pelt oranges at each other with great gusto – originally, it is said that beans were first hurled at each other by the participants – then apples, before oranges became the familiar choice. The event is part of a traditional Ivrea carnival which takes place in around the third week of February (in 2012, it took place between the 18th and the 21st). The Game Of The Bridge is said to date back to February 22nd 1568, when opposing teams from various areas in Pisa battled each other for the symbolic ownership over the Bridge over the Arno river. Unlike today, the battle would usually end in violence and fighting. The origins over this battle are vague, and there are a number of theories as to who started the event and why. The most common two names are the mythical founder of Pisa, Pelops, who wanted to see a recollection of his native Olympic Games, or Roman Emperor Hadrian, who wanted to see his version of gladiatorial games occur on the shores of Arno. Somewhat more genteel than the original violent event, today's Game Of The Bridge, nevertheless, still sees a competitive spirit among the participants. There is a great emphasis on culture and spectacle – for example, before the battle, a parade of representatives from both north (Tramontarna) and south (Mezzogiorno) sides of the Arno river march along the banks of the river. Each parade comprises around 300 people who are clad in 18th century costumes and armour, bearing banners of the competing teams. Once the two parades have met, the game begins – the aim of the game is to win as many battles as possible. The battle in question is to push a wooden trolley (which weighs more than seven tons) into the opposing team's territory and thus claim ownership of the bridge. Although the game began on a February day, these days, the annual battle takes place on the last Sunday of June. The Patron Saint of Matera is Maria Santissima della Bruna – July 2nd marks her Saint's Day, and it's marked by a day-long festival. The Festa Della Bruna is said to have been started at the request of Pope Urban VI on 9th November 1389 – the story goes that a peasant agreed to take a mysterious noblewoman to Matera on condition that the woman left the traino before Matera so as to not raise any possible questions. But by the time the peasant reached Matera, the woman had mysteriously vanished – all that remained was a statue. In a letter written by the woman that was given to the Bishop, it revealed that the woman was the Virgin Mary. The statue was welcomed by both the Bishop and clergy and after being carried three times around the Piazza del Duomo, was taken in procession around the Cathedral. The main event is the procession that flanks a statue of the Madonna and child. The statues are escorted at midday to a float made out of papier-mâchè in the neighbourhood of Piccianello – which is close to the church of Annuziata, which is said to be the location of the aforementioned event concerning the Virgin Mary. The float and statue are then ushered by costumed men on horseback, in procession, and taken back to the Cathedral. After carrying the float three rimes around the Piazza del Duomo, the statues are placed inside the Cathedral. Following this, the procession's solemnity is replaced by the decimation of the float. The townsfolk will smash the float to pieces, and it is said that anyone who claims a piece of papier-mâchè will be blessed by good luck for the next year. The event ends with a large-scale fireworks contest above the old quarters of the Sassi. 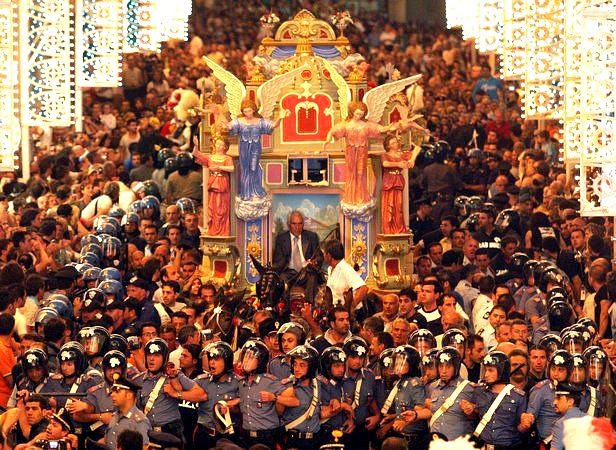 The Festa Della Sensa is also known as the Ascension Festival and commemorates two important events in Venetian history. It marks the beginning of political, trade and military expansion of the Venice Republic. This occurred after the 26th Doge of Venice, Pietro Il Orsedo, sailed off on 9th May 1000 with a fleet to aid the populations of Dalmatia from Slavonic pirates. This resulted in a victory for the Doge and the fleet, and the Festa Della Sensa marks this victory. It also marks the conclusion of the secular diatribe between the Papacy and the Empire, when in 1177, Pope Alessandro III and Emperor Federico Barbarossa made a peace treaty. The main centrepiece of the event is the Wedding With The Sea. This represents the Venice Doge's blessing from St Peter of the Castle at St Elena – this would culminate in the Doge throwing a golden ring into the sea to symbolise the union between the Republic of Venice with the sea. 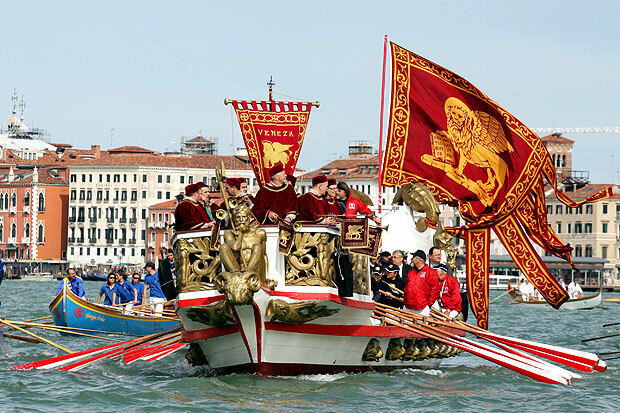 Today, the historic event is marked by a regatta that heads from St Mark's to St Nicolò – a golden ring is thrown into the waves at the climax. The event is also supported by a greater wealth of cultural initiatives such as a water parade, Venetian style rowing and the Sensa Market. There are also two initiatives that recognise areas, cities and individual citizens who have both formed a good relationship with Venice in terms of culture and sea-based activities (Adriatic Twinning) and in terms of promoting business, crafts and culture (The Premio Osella d'Oro della Sensa Award). 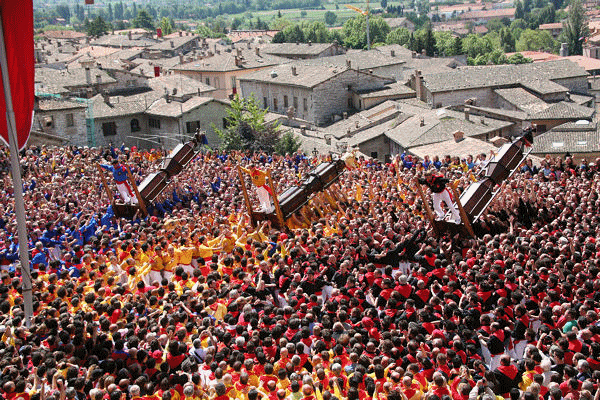 La Corsa Dei Ceri is the procession marking the eve of the death of Bishop Ubaldo Baldassini, who was canonised as Protector of Gubbio. The event revolves around the eponymous Ceri – or candles. In this case, the candles in question are large, wooden objects in the style of battering rams. At the start of the ceremony, the candles are carried by three teams of men from the Palazzo dei Consoli and taken to the Piazza Grande. Once there, the teams attach small statues of St George, St Anthony and St Ubaldo to one end of each candle. After bells have rung out at 11.30am, the teams lever the Ceri in upright positions, with the captain of each team at the top of the pole bearing a large ceramic vase of water. The captains will then fling the vase as far as they can into crowds of people. It is said that if any of the crowd successfully obtain a piece of the shattered vase, then they will have good luck and good, healthy crops for the next year. After this, the Ceri are taken three times around the Piazza and then at 2pm, a large-scale seafood banquet takes place. At 4.30pm, a religious procession of the relics of St Ubaldo takes place before the big race at 6pm. The curious thing about the race of the Ceri is that St Ubaldo always wins. The candles are raced up 300m of mountainside into the mountainside basilica – once inside, the victors must try and keep the runners-up out. But the real aim of the contest is to not drop the candle. The team that drops the candle the fewest times is actually the winner.